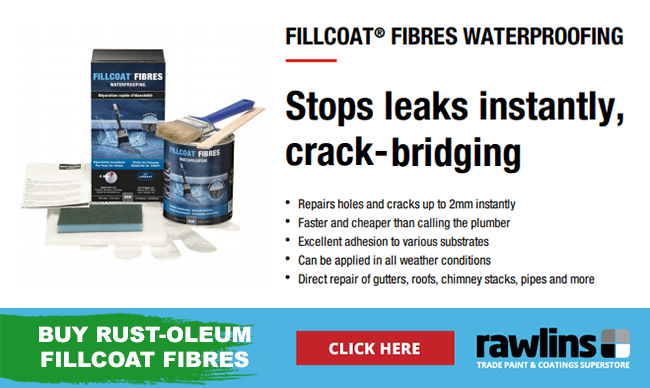 In December 2015, Rawlins Paints published an article about how to repair your flat roof, and it received great feedback and further requests to do a follow up roof repair article. Who are we to not write about subjects we love? Read that article here. Viewing on mobile? Want to shop the flat roof fixes immediately? All products featured can be found here. Repairing a flat roof (be that a school or hospital, outhouse or storage) is similar to fixing a puncture on a bicycle tyre. There does come a time when emergency fixes suffice, and others when a permanent flat roof repair job is required. Simple roof repair DIY fixes are great, although if you are ready to take the next step and look at doing a more complicated professional level fix, read on. Water torture can be unbearable, especially dripping through the ceiling on a cold and windy night. Nobody wants to get the step ladder out and risk a National Lampoon’s accident, so all Chevy Chase advice has been omitted from this article. TIP 1: For safety purposes, never use a simple step ladder when repairing a flat roof – due to the height, even on low roofs, use scaffolding or a stable platform. Ensure there is no public risk and if in doubt, contact a professional for advice. Although they are named flat roofs, they all should in fact be slanted to a gradient of at least 1 in 80. This allows for water to run off it and prevents water from pooling in areas that may sag over time and get further damage from exposure to harsh seasonal elements. Flat roof decking should be marine or WBF (water boiling proof) plywood. Part L of the Building Regulations (Conservation of Fuel and Power) dictate re-covered flat roofs above habitable parts of a building (not including garages or outhouses) must be insulated to the current standard (do this by notifying the local authority’s building control dept). This can be done by laying rigid foam insulation boards on top of weatherproof covering. Long before the dripping through the ceiling starts, dark brown patches of moisture can develop, as damp from a damaged flat roof seeps slowly through. It is at this stage that you need to get the leak fixed or at least investigated to check whether it is a small joint fix that is required or something bigger. If you are in doubt about the safety of climbing onto a flat roof and whether it can sustain your weight, please do contact a local professional roofer. If the roof is old and in an exposed area, its timbers may have become rotten over a sustained period of time. Timber can also sag under pools of accumulated water and old chipboard decks can break up/disintegrate when damp – look for concentric circle stains from dried up water in low spots on the roofing too and not just for pools of water. TIP 2: Place a board across the flat roof to walk on and spread your weight. Do not position the board close to an edge and place ‘markers’ in areas that may otherwise be in your blind-spot. Locating the source of the leak is not as easy as looking directly above where the damp patch is on the ceiling. Water can get under the surface and run in any number of directions between layers before it leaks through the boarding and into the room below. Should the condition of the roof have deteriorated beyond repair, it may be time to call a professional in to survey or replace the whole roof. Look for major tears, ripples or splits and take photographs to show to a professional roofer if necessary, as small fixes to big problems can lead to longer term headaches and financial woes. The best time to look for a leak is when the roof has been dry for at least three days, and in the evening/night-time, when after cooling down, the flat roof leak ‘hot-spot’ will release heat that has stored underneath the hole during the day. Firstly, measure, from the outside wall of the room, along the ceiling to the damp spot/dripping area. You may find, especially on more slanting flat roofs, that there is no damage or ponding of water above this marker. Next, it’s time to look directly upwards of this area for somewhere that could cause the leak – usually around obstacles or junctions – for example, step or metal flashing that has come loose due to heat expansion and may need replacing or repairing (around chimneys and skylights). Check for loose tar and materials that may provide gaps in which rain water could seep through – if it can be pried back under inspection, then water can get into it. The sun’s heat can cause movement of a roof structure, creating splits or cracks and whilst the roof felt’s flexibility should be able to withstand this, be observant for small areas of damage by clearing away leaves, chippings or other debris. Check any seam in the roofing material, as any gap or hole could be the culprit causing the leaking roof. Check that there are no missing roof nails, or excessive rust damage on existing ones, as these may be causing the leak. At the same time, inspect the guttering around the flat roof for blockages or leaks that are accelerating the deterioration of the leakage area. Plants should be kept for internal flower pots and in garden beds, so if you see any on the flat roof, this could be another place where water is collecting and where the leak could potentially be. If there are any flaws in the top layer, like additional roofing tar patches or caulking, these are temporary patches that may have deteriorated quickly due to poor application. Should you still not be able to find the leak, it is time to start adding water, with a hosepipe or manually applied, to the roof in small sections, whilst someone checks the inside ceiling. Remember, water takes the least resistant path to get to where the dripping/damp patch is, so do not predict the leak to be directly above it. This process can be time consuming and the more detailed and regimented that it is executed, the more accurate it can be in determining the location of the damage on the flat roof. The flat roof should be clear of all debris – even if the leak has been found, to ensure there isn’t more damage that needs repairing at the same time. Then, before washing the area that needs repair work, make sure that safety procedures have been set up and that no ‘through-way’ from anywhere on the roof to the exit is blocked by any obstacles or excessively slippery. Wear hi-vis clothing if possible and when using a hose-pipe or pressure washer, do not have piping trailing where it can easily be tripped over by people accessing or leaving the flat roof area. Common damage issues include blistering (bumps of trapped moisture which can burst) in the asphalt from heat conditions, cracks, wrinkles and/or splits, and sagging. 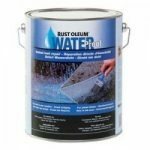 Applying Rust-Oleum waterproofing roofing paint to the crack/damage works very well as an emergency solution to seal gaps. All products sold at Rawlins Paints come with instructions and usually PDFs are also available for download. Asphalt roofs can be repaired by having a small patch of roofing felt torched on. Alternately, one of the professional liquid systems available at rawlinspaints.com can repair leaks on asphalt roofs. Common damage issues include cracks in or surface wear to the concrete roofing. Surface wear can hide cracks, so be sure to clear away any loose debris. Application of a thin bitumen primer, followed by a bitumen based paint can help waterproof and seal any cracks in the concrete. 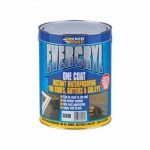 Everbuild’s Evercryl one-coat is a fibre re-enforced roof repair that gives instant results, even in wet weather. 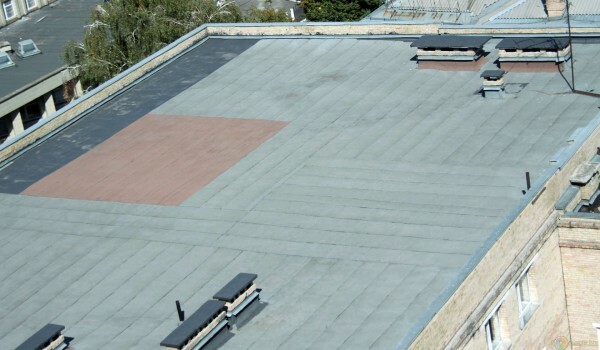 Larger and more ‘obvious’ cracks on a concrete flat roof can have a small patch of torch-on roofing felt added as a layer on top – this requires a smooth surface for the top layer to fully seal and waterproof the leaking area. Common damage on rubber roofs can come from falling debris, such as roof tiles or slates, causing tears, deep cuts or holes. Application of lap sealant can fix small tears and holes. It is advised to not use excessive quantities in case further work needs to be done for a permanent fix. A small patch can act as a permanent EPDM roof repair for leaks and cracks. Apply an EPDM primer and when touch-dry, add self-adhesive rubber tape 3” around malleable flashing covering the hole. The patch should be adhered from the centre (over the hole) outwards with a firm, hard roller. Additionally, lap sealant which can be used as a temporary fix, can be applied around the edges as an extra waterproofing precaution. Old pour and roll felt roofing can crack, get puncture holes (usually from impact), or the felt could split. Edging can also lift, or old flashings against the wall could leak. The surface may also suffer from dips or hollows. As with most temporary flat roof repair work, a paint on solution can fix leaks. A number of these products are available at Rawlins Paints. 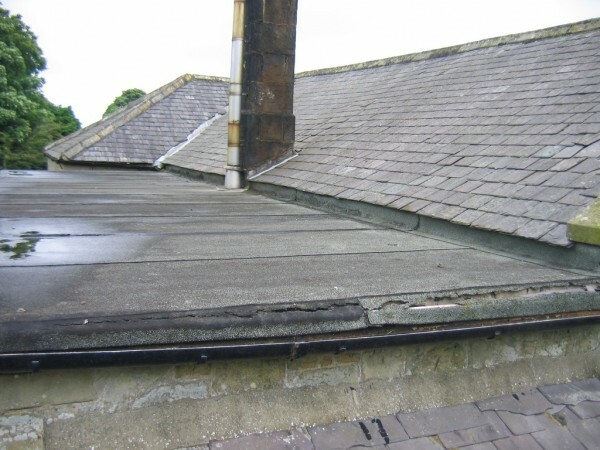 If the old layer of felt roofing is in good enough condition, then a liquid system repair can be applied. For older felt roofing, a patch of torched on roofing with add an additional layer and fix the damage. Please ensure that the user of a torch flame to conduct repair work on felt roofing is insured to work with naked flames, and always have a readily available and easily accessible fire extinguisher to hand. One of the main sources of damage on fibreglass flat roofs can be GRP flashings near abutting walls that leak, or cracks/splits near board joints, trims and/or upstands. Cracks can also occur from expansion and contraction, caused by seasonal extremities. Once the area is cleaned with warm soapy water, acrylic sealant can be applied around and over the small crack or hole, reinforced by plasterers’ scrim. This temporary measure can easily be scraped off for a permanent fix. Using acetone and grit paper, thoroughly clean and sand down the area over and around the damage. Next, a chopped strand mat (600g) needs laminating into place on top of and under a resin coating, with all bubbles removed. Finally, after curing, a topcoat (colour matching the original fibreglass roof) needs to be applied. For further assistance, please contact Rawlins Paints’ customer service team here. Leaking roof repairs are mainly done by the roofers whose main aim is to install. Re – roof or repair and also they should keep in mind that it is done in a sunny weather with nobody getting hurt on this. Thanks for sharing some great tips for roof repair. I am looking to read more post from you. Expansion and contraction can cause cracks in the roof due to seasonal extremities. 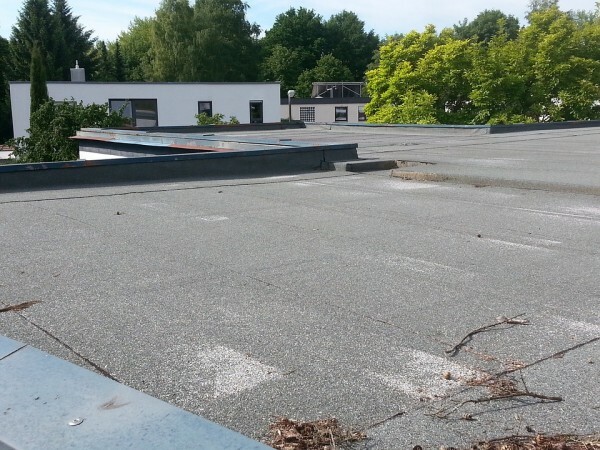 You stated that repairing a flat roof is similar to fixing a puncture on a bicycle tire and there comes a time when emergency fixes suffice, and others when a permanent flat roof repair job is required. Do the repair techniques differ for flat roofs opposed to slanted roofs? My brother is wanting to purchase a building for his future small business and is trying to decide what kind of building to buy. Finding a good roofing contractor that can repair the roof if needed could be very beneficial. 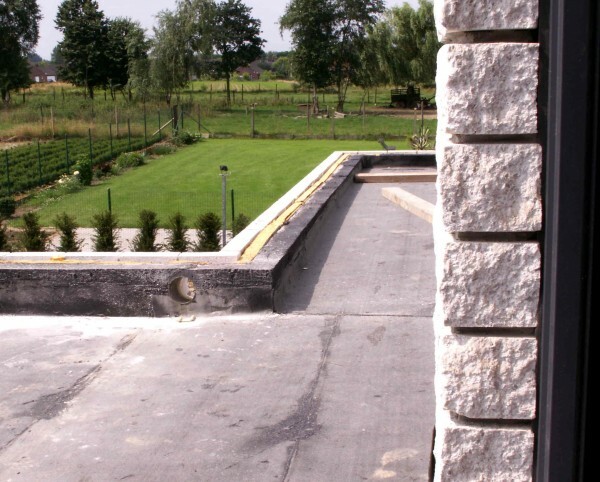 Yes, there are differences in repair materials available for flat roofs and slanted roofs. It is best that you/your brother contacts our technical support team, or that you provide more details about you/he requires. Dependent on the scale of the repair work needed for a flat roof, you may be able to fix it, with products available and recommended in this article, or yes, you may need a good roofing contractor for a much bigger job. I have noticed a few stains in my roof. I hope I’m catching all of this in the early stages of a leak. I’m scared there could be some mold because of the leak. 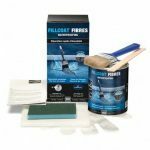 There are a wide range of products and paints available which can help with mould/damp problems from a leaking roof. If you do need some more detailed advice, please contact our technical support team, or let us know some more details on this post. If you have acted quickly (which it sounds like you have), there should be minimal mould/moisture damage. Keep in contact, we’d like to help you further. Thanks for sharing some great tips for roof repair. Hi, the technique you stated for finding a leak on a flat roof is an excellent idea. So simple but hugely scientific. Thanks. This was much helpful. Good tips for spotting those early signs of a roof leak. The sooner you can spot an issue, the better off you will be and it will probably cost you less money. Hi there, roof repairing is quite a task. If not done properly it will devastate your place day in day out in almost every season. Heat and cold will cause contraction and expansion during the summer and the winters and water logging can also damp your walls and ceiling during the monsoons. Thanks for sharing such great tips with everyone. Thank you for talking about how roofs should be clean of all debris before repairing it. It makes sense that doing this can help you assess the problem and make the necessary repairs. I can see how contacting a professional can help you get quality work done and get the best deal for it. Good advice here for spotting the early signs of roof damage. Catching a leak early can save you a lot of money so it’s nice to see these tips out there helping people. Flat roofs can really collect water during a storm, so it’s especially important to make sure there are ways for rain water to stay out of the interior, or else you could have an expensive replacement on your hands far before the roof’s lifetime is complete. Thanks for sharing!